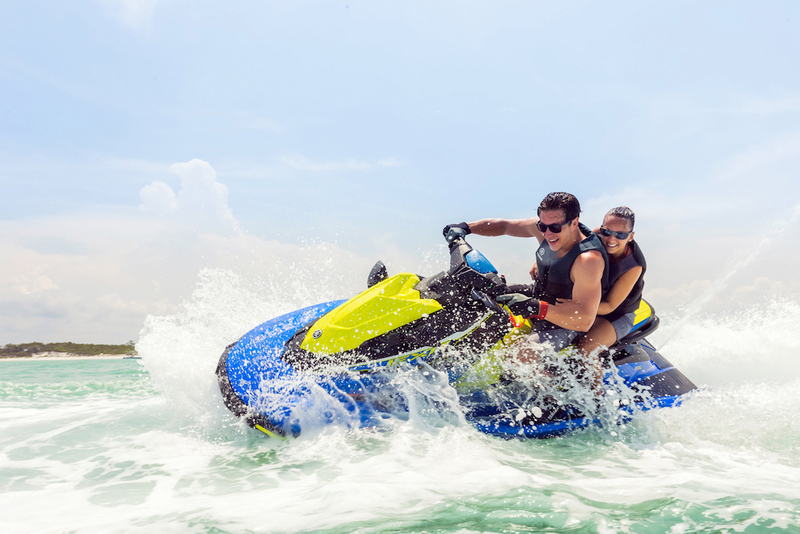 If you're searching for the best of the best when it comes to Jet Skis, WaveRunners and PWCs, there's top five models need to be on your list. 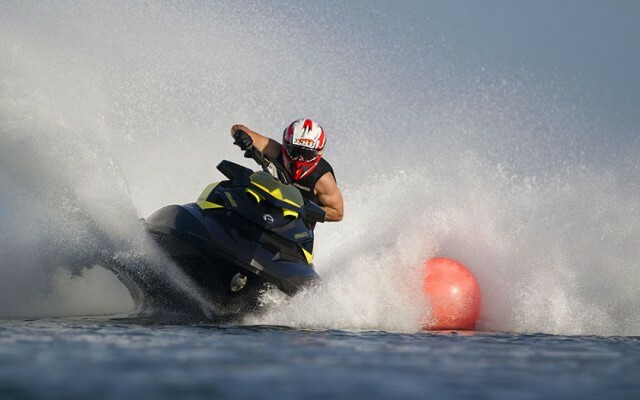 The personal watercraft market has never offered a wider variety of price, performance and technology. 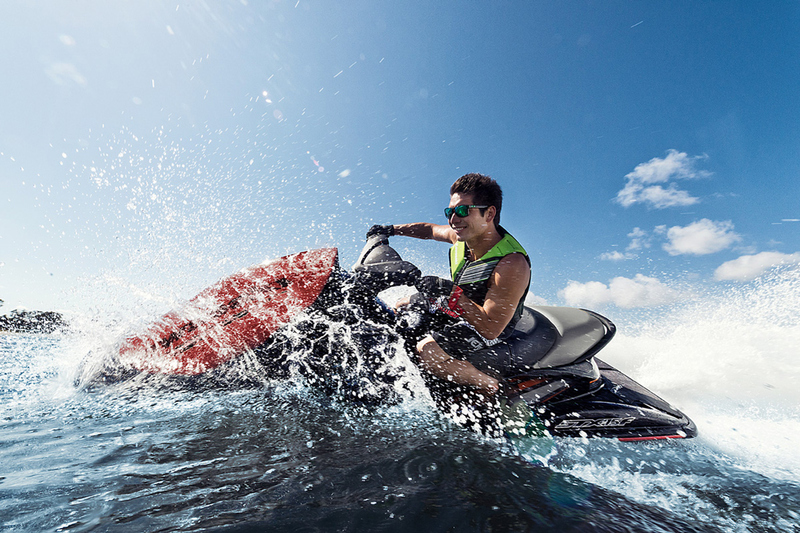 As we roll into the 2019 riding season, let’s profile five of our favorites from the top brands in the category: Kawasaki Jet Ski, Sea-Doo and Yamaha WaveRunner. 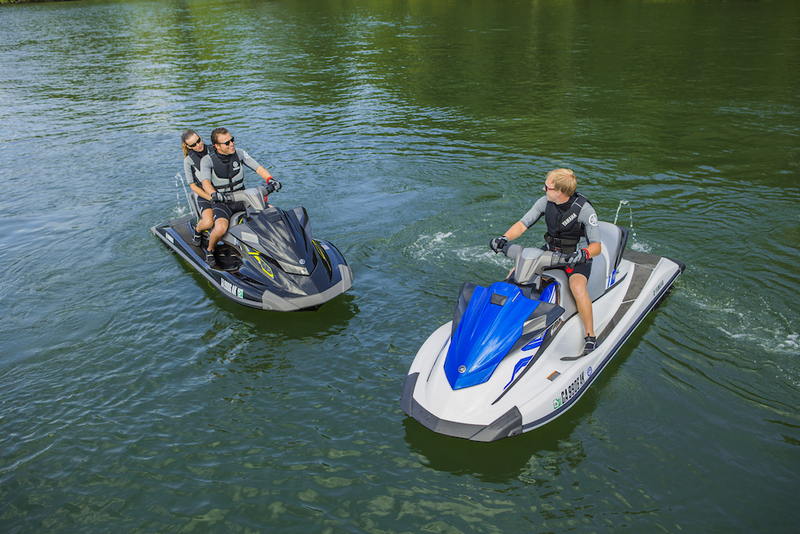 A top performer in the rec-light category, the Yamaha WaveRunner EXR ($9,299) is more powerful and lighter in weight than standard EX models, a formula intended to boost acceleration and top-speed performance. To increase power, Yamaha dropped the 110-horsepower three-cylinder, 1,049cc TR-1 HO engine into the 10-foot 4-inch EX hull, for a 10 percent power boost over the standard EX. To take full advantage of the added power the EXR is also fitted with a new top-loader intake grate that better feeds water to the impeller and a 40mm jet pump extension that increases acceleration response. With a single rider the EXR will offer a top speed of about 54 MPH. The EXR hull and deck are molded with Yamaha NanoXcel 2, the lightest composite offered by Yamaha, for a weight savings of about 60 pounds. For added maneuverability in close quarters the WaveRunner EXR is equipped with Yamaha’s RiDE dual throttle system that combines electronic throttle and shift control in a single-hand lever on the left handlebar grip. The RiDE lever also acts as a decelerator that can be engaged at any speed but is most handy for slowing down when some urgency is required. See Yamaha WaveRunner EXR listings. 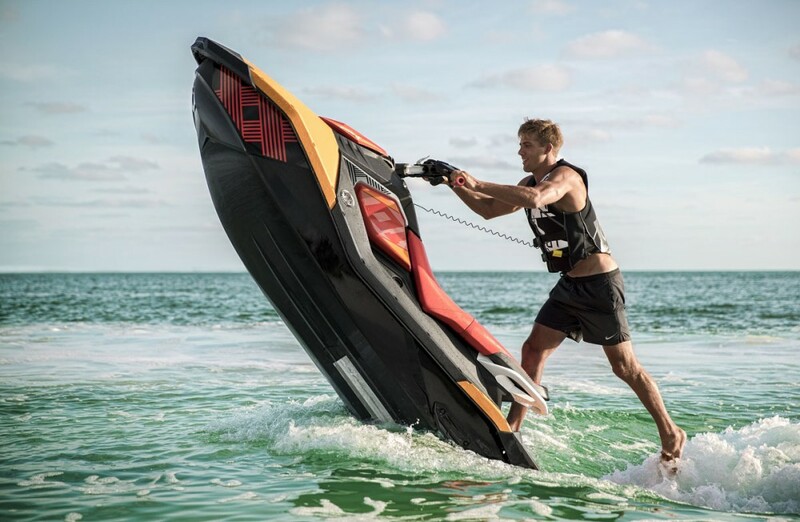 The new Sea-Doo Fish Pro ($14,799) is the first personal watercraft to come from the factory rigged for fishing. The Fish Pro model is based on the 12-foot 3-inch GTX Limited hull. In converting this model for angling action, Sea-Doo installs an 11.5-inch swim platform extension to which is secured a 13.5-gallon cooler designed for fishing, with a recessed work surface in the lid, four rod holders, trolling slots and tackle and bait storage. The LINQ accessory mount system secures the cooler, which can be quickly removed from the craft. There’s also room on the platform to stand behind the cooler. A second set of LINQ attachment points on the extension can be used to mount a 4.2-gallon cooler or a 4.0-gallon fuel caddy. The Fish Pro is equipped with a flat seat to facilitate sitting sideways while fishing, and the tops of the gunwales are angled inboard to serve as a footrest surface. At the helm is a Garmin ECHOMAP Plus 62cv that offers navigation, charting and fish-finding functions. The Fish Pro is powered by a 1.5-liter, 155 HP Rotax 1530 engine. Fuel capacity is 18.5 gallons, or 2.6 gallon more than the GTX Limited models. Top speed will be about 50 mph. Base price includes the fishing cooler system and the Garmin. See Sea-Doo Fish Pro listings. 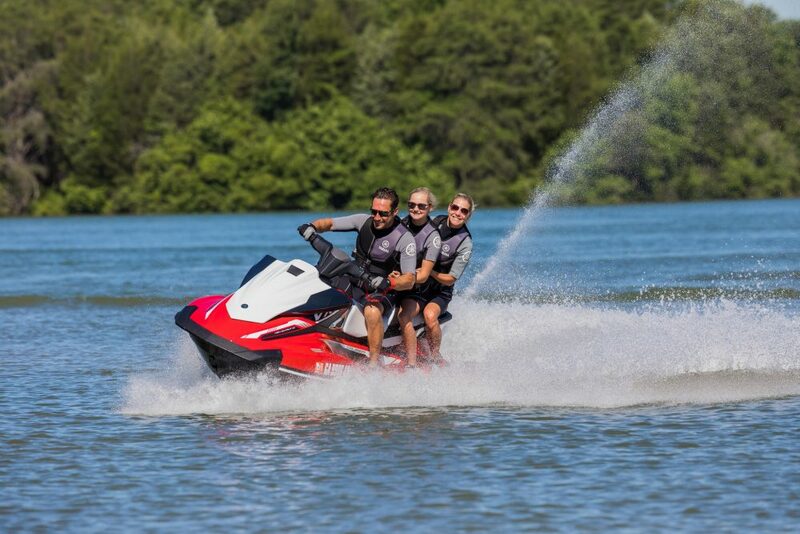 Flagship models of the Sea-Doo portfolio, the GTX Limited 230 ($16,099) and GTX Limited 300 ($17,099) offer a combination of amazing performance and innovative features. Both are based on the 11-foot 4-inch Sea-Doo ST3 hull designed to work well in an offshore environment, with a soft ride and steady tracking, and to offer stability at rest as Sea-Doo says more people are using these large models as a “hang-out” platform in quiet coves and bays. The innovative design of the bow stowage compartment makes it much easier to reach gear that’s been stashed under the cowl. The entire helm – handlebars and instrument display – lifts with the hatch. 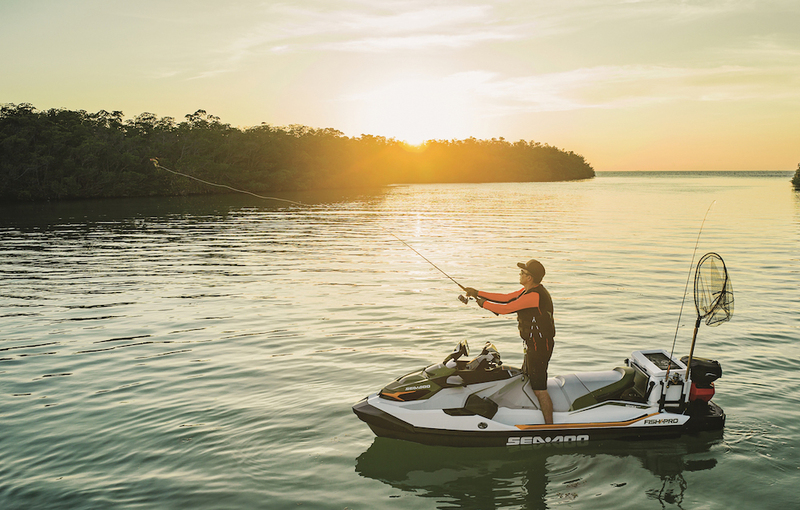 Keeping up with our craving for connectivity, the new Sea-Doo models all feature a cushioned, water-tight phone box in with a USB port in the glove box. A Bluetooth 100-watt marine audio system is standard on the GTX Limited and features a pair of 6.5-inch speakers in enclosures placed above the forward footwells. Another innovation, the LinQ accessories system utilizes a pair of pop-up composite cleats in the aft deck to secure four accessory items: a 4.2-gallon cooler, a 5.5-gallon dry bag, and a 4.0-gallon fuel caddy, or a LinQ retractable ski pylon. The GTX Limited 230 is powered by a 230 HP Rotax 1500 HO ACE engine, and supercharged 300-hp Rotax 1630 ACE engine powers the GTX Limited 300. Both model are speed-restricted to 67 mph, but the 300 accelerates much harder than the 230. Both models come equipped with the Intelligent Brake and Reverse (iBR) system, Intelligent Throttle Control with three riding modes: Touring, Sport (more aggressive acceleration) and ECO® (soft acceleration and speed limited to about 35 mph for economy), electric Variable Trim System (VTS), cruise control and slow mode, and tilt steering. In addition to the audio system, the Limited models feature a storage bin organizer and dry bag, a safety equipment kit, a watercraft cover, and two additional gauge functions (time/distance to empty and altitude indicator). See Sea-Doo GTX Limited listings. The Yamaha WaveRunner FX Limited SVHO ($17,399) tops the premium WaveRunner FX series, offering a long list of features and maximum horsepower and performance. 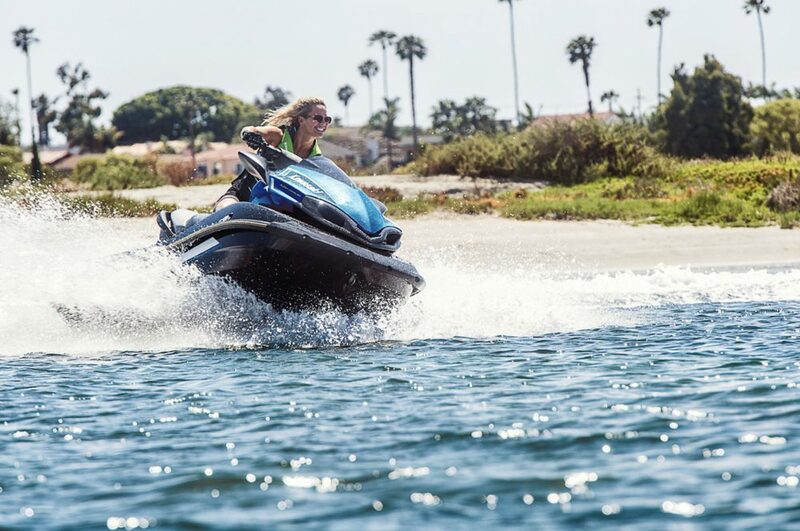 This model features the 4.3-inch Yamaha Connext touch screen display, which replaces all instrumentation and the functions of the key fob remote control previously supplied with FX WaveRunner models. The system incorporates Drive Control, which allows the user to limit top speed and control the rate of acceleration, a handy feature when towing. The multi-mount system converts two drink holders on the FX cowl into accessory holders using “pucks” that have a threaded insert designed to accept RAM Mount kits. Yamaha offers a set of ECOXGEAR waterproof Bluetooth speakers and Garmin Striker GPS Fish Finder for the mounts. The rechargeable speakers can play music a phone and can be used to place and receive calls with a voice-activated. The speakers can be popped off the WaveRunner and used on the beach or anywhere else. The 1.8-liter supercharged SVHO engine cranks out about 250 horsepower and will take the FX Limited to a 67 MPH top speed and accelerate to 60 MPH in less than five seconds. The 11-foot 8-inch hull is formed with ultra-lightweight Yamaha NanoXcel 2 composite and is designed to lean into a turn to put less strain less strain on your upper body in turns. The deck features self-draining footwells, and the forward storage compartment has a molded area for a soft cooler bag. 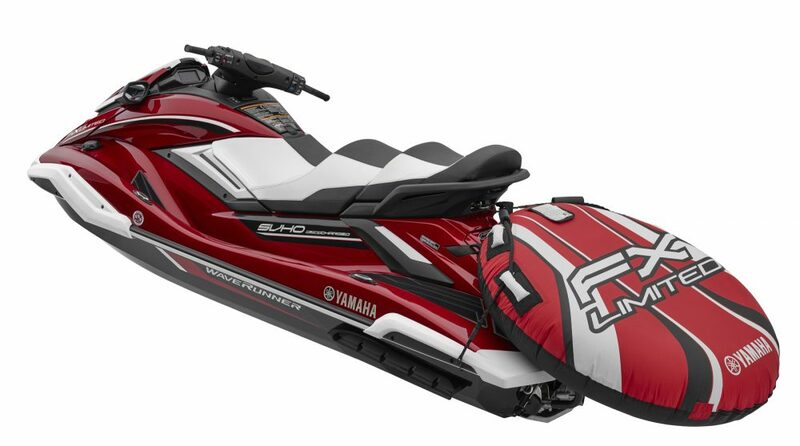 The aft deck is big enough to carry a secured one-person tube, and Yamaha has redesigned both the rear grab handle and the padded reboarding step for improved comfort. This model is equipped with the Cruiser seat with deep bolsters for each seating position. The FX Limited SVHO also combine with a long list of accessories, including a single-rider tube, a tube inflator, tube holder to secure the tube to the aft deck, a tow rope, the soft-sided cooler, a cover, and two fenders, plus the Tech Package with two ECOXGEAR waterproof Bluetooth® speakers, the Garmin Striker GPS fish finder and the required RAM Mount hardware. See Yamaha WaveRunner FX Limited SVHO listings. 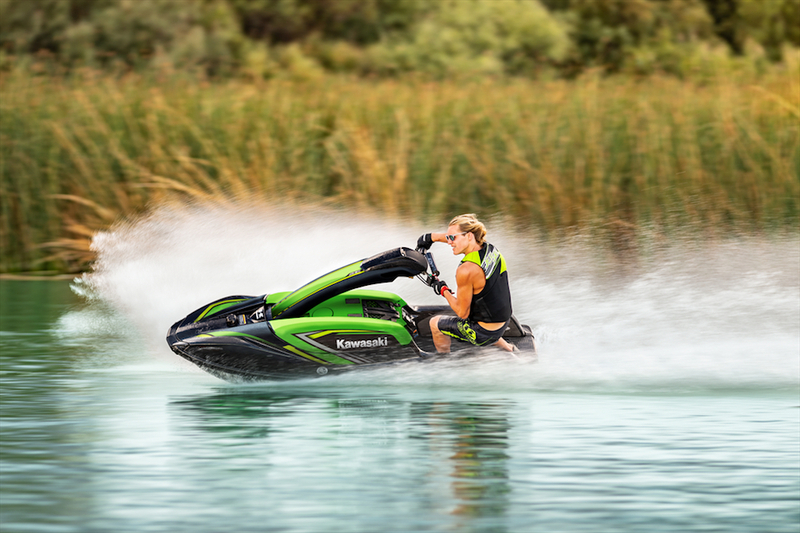 The Kawasaki Jet Ski SX-R ($9,999) is a 21st Century interpretation of a 20th Century idea. 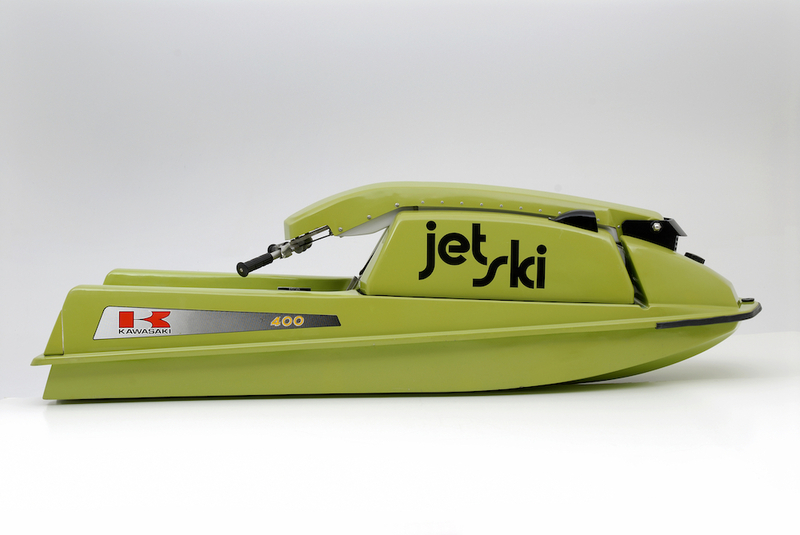 The original stand-up Kawasaki Jet Ski popularized the sport in the late 1970s. 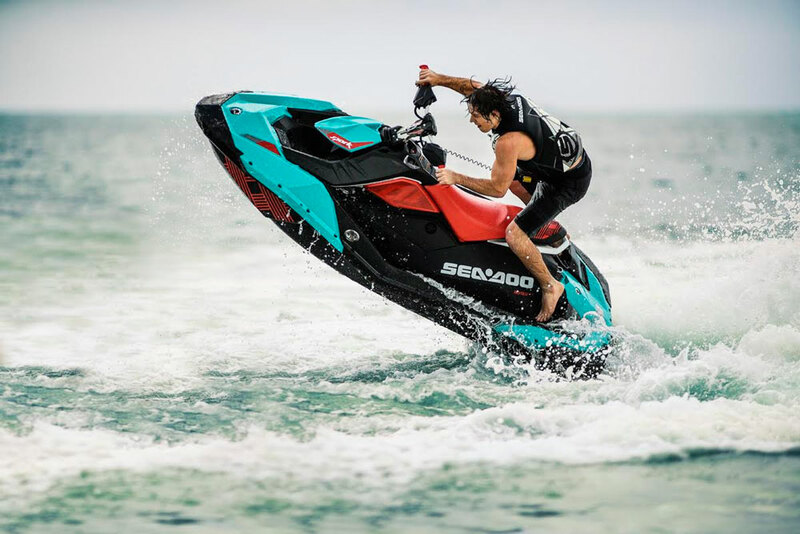 The current Jet Ski SX-R is designed to reignite the passion of stand-up PWC riders with an all-new platform powered by a 1.5-liter four-stroke engine. The most-previous Jet Ski SX-R went out of production following the 2011 model year, a victim of new emissions regulations and flagging sales. The 2017 SX-R is larger and offers a new riding experience with a wider, v-bottom hull and a 150-horsepower 1.5-liter four-stroke engine with a broad-and-steady powerband. With a length of 8 feet 8 inches and a beam of 2 feet 6 inches, the new SX-R is 14 inches longer and 1.3 inches wider than the previous SX-R and at 551 pounds, weighs a significant 181 pounds more than that Jet Ski did. To accommodate that weight, the running surface is wider to provide added buoyancy. The added length is obvious in the nose, where the new SX-R extends further forward from the handle pole pivot. The handle pole now incorporates a small stowage compartment and low-fuel and engine warning lights. A magnetic key is a theft-deterrent. Riding even this new stand-up Jet Ski is not as easy as riding a runabout PWC, but that’s what makes it fun. It’s a bit of a physical challenge that remains entertaining ride after ride. See Kawasaki Jet Ski SX-R listings.